This edited volume is a much welcomed contribution to the most significant debate of our time. For critical thinkers, it is glaringly evident that the dominant approaches being invoked to address the ongoing condition of human misery and worsening global ecological crisis are simply not working, and in most cases are proving actually to be counter-productive. However, hegemonic narratives confidently promise that slight modifications to the same political economic processes that brought us to this conjuncture will be able to allay the growing crises, while simultaneously carrying humanity to new heights of economic development. Yet, many who see through the greenwash find themselves in a state of utter despair and often paralysis, given the closing window of time to mitigate global warming (22-9), and the dearth of meaningful transformative strategies on the horizon. Given the ‘do or die’ imperative radically to rewire our systems of production and consumption as quickly and justly as possible, Green Growth: Ideology, Political Economy, and the Alternatives is crucial reading for all. 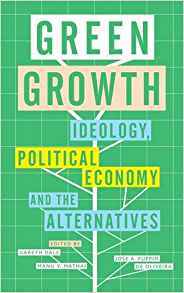 The book begins with several chapters that critically interrogate ‘green growth’, the latest techno-market fix being proffered, with authors considering the genealogy and implications of the discourse conceptually in Part I. Chapters in Part II engage with applications of the green growth narrative in practice by analysing national and transnational level policies and material flows through case studies. The final three chapters constituting Part III reflect upon, engage with, critique and/or promote some of the ‘alternatives’ being attempted, ranging from reformist to radical. The volume’s Introduction contextualises ‘green growth’, a mainstream ideology that arose ‘when the neoliberal paradigm … wobble[d] … egregiously in the wake of the global economic crisis of 2008’ as a way for the system ‘to seek reinvention’ after ‘the policy regime faced a legitimacy crisis’ (5). This approach, the editors explain, was part of a tradition that emerged with the mainstreaming of environmentalism that began in the 1970s when oil prices were high, ’environmental economics’ was invented, and critiques of industrial civilization were becoming prevalent. By the early 1990s, a quest for an approach dealing with rising concerns about pollution of the environment and a palpable sense of social exclusion coalesced into a policy demand for ‘sustainable development’, which had ‘assumed a starring role as gospel and mantra’ for its supposed win-win aim of ecological sustainability and conservation in a democratic, inclusive manner that was also compatible with economic growth (3). The editors distinguish the now dominant discourse of ‘green growth’ from its ‘sustainable development’ predecessor, with the former insisting that ‘environmental sustainability is not only compatible with but also depends upon the market system’, demanding to see nature as a type of capital to be measured and often enclosed and commodified, and making no attempt to concern itself with questions of ‘social justice, conservation or the active state’ (4- 5 emphasis added). In the aptly named Part I, “Contradictions of Green Growth”, Larry Lohmann, James Meadway, Adrian Parr and Ulrich Hoffmann offer powerful analyses of different dimensions of the contemporary, and quite possibly ultimate, crisis of capitalism, elaborating upon the historical processes bringing our planet to this particular conjecture and the arithmetic impossibility of ‘green growth’ resulting in any semblance of meaningful greenhouse gas reductions and mitigation of temperature rise in the near future (23-41, 43-67). As is evident in the debates engaged with by these and by chapter authors in the ‘Case Studies’ investigated in Part II of the book, academic literature is becoming increasingly rich in critiques of ‘green growth’ and related narratives. Particularly sharp analyses reveal how green growth and related narratives are deployed, in whose interests, and to what material ends (114-65, 187-211). The cases of failure of ‘green growth’ in South Korea, the EU, and Brazil, as well as the cases of environmental conflict in India and Latin America by Martinez-Alier and colleagues, supply further empirical teeth to the arguments by authors in the previous section on the contradictory and insufficient outcomes of techno-market approaches to address the issue of ecological annihilation. Such empirical work at once operates to deepen the debates, while at the same time exposes itself as part of a conversation ridden with theoretical and conceptual inconsistencies. For instance, although the volume’s editors began to historicise concepts such as ‘green growth’, ‘inclusive green growth’, ‘sustainable development’, ‘eco-modernism’, the ‘green economy’ and ‘green governance’, the conceptual variance in use by different chapter authors in the book reflects the contradictory and varying attempts to operationalise such concepts in general. These diverging understandings and uses of such terms boil down to fundamental disagreements about the degree to which capitalism can offer a path out of the abyss, and the types of actions required to re-orient socio-economic processes in the direction of producing an ecologically sustainable and more just society. In other words, the problem of conceptual inconsistency, across these chapters as well as within various ‘alternative’ initiatives, reflects the difficult fact that we have one foot firmly locked within the confines of the present socio-economic system, while striving to propel the other foot forward into an alternate, ecologically sustainable and socially just future. This context is hardly a fault of the volume’s editors, and it is indeed to their credit that they have attempted to put often siloed, though obviously linked, discussions about pathways forward into conversation with one another, thus opening up these critical debates to be contested seriously in the struggle to bring about theoretical and conceptual clarity. Yet the predicament is grappled with intelligently by some of the early chapters as well as in the final section of the book, ‘Emerging Alternatives’, with all of the tensions remaining. As explained by many of the chapter authors, addressing these ecological crises will require a managed decline of the economy, involving actively planning across scales for a process of degrowth, largely localised production and exchange, and a commitment toward principles of sufficiency, equality, and ecological sustainability. While Ashish Kothari’s chapter laying out an extensive vision for a ‘Radical Ecological Democracy’ paradigm in India where he delineates the kind of social democratic reforms required for transitioning to a sustainable and equitable world, his account suggests that public pressure will be enough to influence state power to make changes putting more power into the hands of people to engage in direct democracy at the local scale. Offering many examples of feel-good initiatives underway in India, which, like the contradictory ‘alternatives’ in food production systems critiqued in the final chapter by Böhm et al, are integrated into the market, as well as categorically stating that the profit-motive has no place in a RED society, the dialectical tension between going from where we are today to the world we need remains evident (212-32, 253-70). On the other hand, James Meadway powerfully argues that countering the logic of capitalist accumulation cannot be merely a matter of choosing to create a steady state capitalist economy, as advocated by John Stuart Mill, E F Schumacher, Tim Jackson and some variants of contemporary de-growthers, but rather that meaningful economic restructuring necessarily involves a political contest, not just administrative changes, in order to address the problems of social relations within the economic structures by removing competitive relationships. Meadway argues that reducing work time, providing a basic income, and stressing the weakness of ‘growth’ as a target, as well democratising the production process are fundamental to this aim (90-113). This volume invites us to move beyond merely critiquing the adversaries, and to begin fleshing out a shared understanding of how power operates and, crucially, working together to theorize a credible path forward. Only when we unite in our analyses of conceptual and theoretical underpinnings of the crises will we be able to produce a coherent strategy and alternative plan. This book is an important contribution to this effort.